Seriously, is there a better tagline for this movie? It has just the right level of cheese, making you laugh hard enough to actually consider seeing this movie (even just a little bit). Alien vs. Predator: Requiem is being released Christmas Day, and the studio isn’t doing any advanced screenings. (Gee, I wonder why…) And when I thought it couldn’t get any better than the tagline, I got the hook up with this Christmas tree ornament. 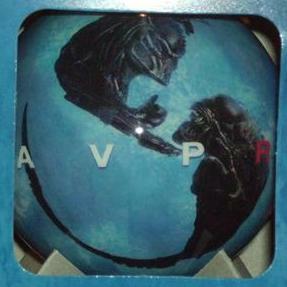 As you can see from the pictures below, it’s not just any tree decoration: it’s an AVPR ornament! After seeing this, I have to wonder if the movie is actually worth the $4 ticket at the local AMC theater. We’ll see. P.S. 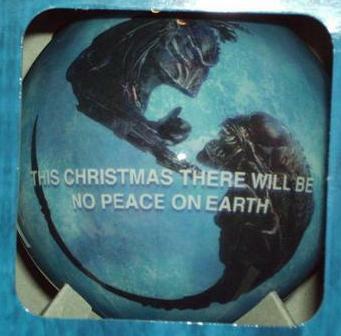 In case you were wondering, yes, they are supposed to be fighting over the earth, just perfect for the shape of the ornament. I feel so guilty for even thinking about seeing this.